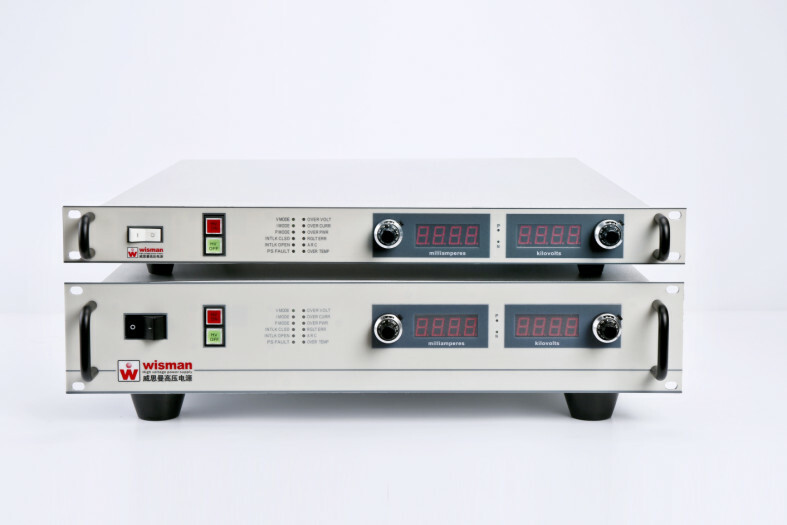 TWisman's DL Series of high voltage power supplies are designed to meet uncompromising performance standards in a minimum of space. Their circuitry includes a resonant high frequency inverter with proprietary control which provides faultfree operation in extreme transient and arcing environments with greater than85%efficiency.These full featured supplies are available in a wide range of outputs with many options. Capacitor Charging, Electronic Component Aging, Insulation Test, High Voltage Testing, Electron Beam /Ion Beam,Focus Ion Beam, Ion Inpouring, Lithography Technology, Electrostatic Applications, Electrostatic Deflexion, lectrospinning,Electrophoresis Capillary Electrophoresis, Microchip Electrophoresis, DNA sequencing, Piezoelectricity material Testing,Science,Laboratory Applications, Industrial Applications. 1kV~130kV Maximum output Voltage option.10W~1200W Maximum output power option. Stability:0.02% per 8 hours after 1/2 hour warm-up. Ripple:0.01% p-p of maximum rated output voltage. Front panel: voltage are continuously adjustable from 0 to maximum voltage by internal potentiometers. External remote:voltage are continuously adjustable from 0 to maximum voltage by 0 ~ +10Vdc External voltage. Front panel: current are continuously adjustable from 0 to maximum current by internal potentiometers. External remote :current are continuously adjustable from 0 to maximum current by 0 ~ +10VdcExternal voltage. Voltage/Current Monitor:0 ~ +10Vdc volt corresponds to 0 to maximum output, Zout=11kΩ, accuracy:±1%. Remote Voltage Monitor:JB2 contain a 0 ~ +10Vdc voltage signal,it can connect digitalor index display. Voltage Load Regulation:0.005% ( no load to full load change). Voltage Line Regulation:±0.005% (input voltage line change±10%). Current Load Regulation:0.005% ( no load to full load change). Current Line Regulation:±0.005% (input voltage line change±10%). input connector:DB15 connector,contain control and monitor signal. Dimensions 10W~300W:2.17”H x 19.00”W x 19.00”D(55mm x 482.5mm x482.5mm). Dimensions 600W~1200W :5.17”H x 19.00”W x 19.00”D(132.00mm x 482.5.00mm x482.5.00mm). scientific instrumentation; and power feed systems for undersea cables. wisman is headquartered in the china. that provide design, manufacturing and service to our customers throughout the world. 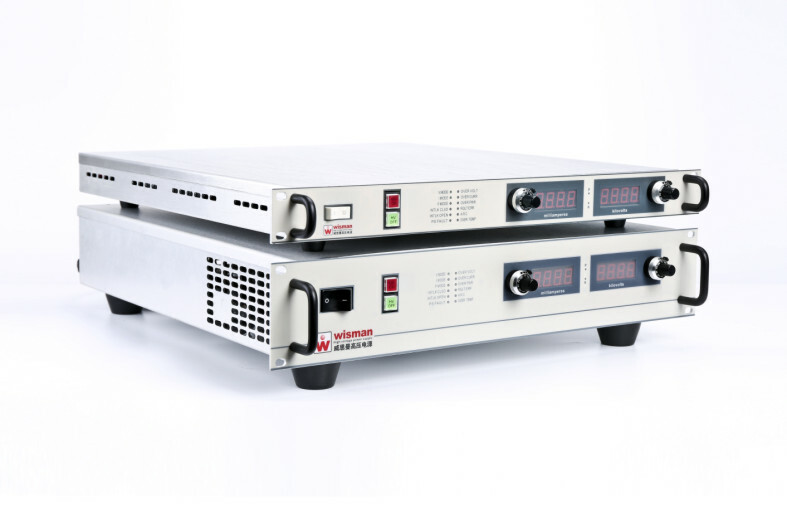 Product introductionSUMMARYWisman＇s XRA Series of regulated X-ray power suppliesoffer output voltages to 30KV and incorporate a filament supply which provides regulated dc current adjustable between 0A and 3.5 A AT 5.5V. 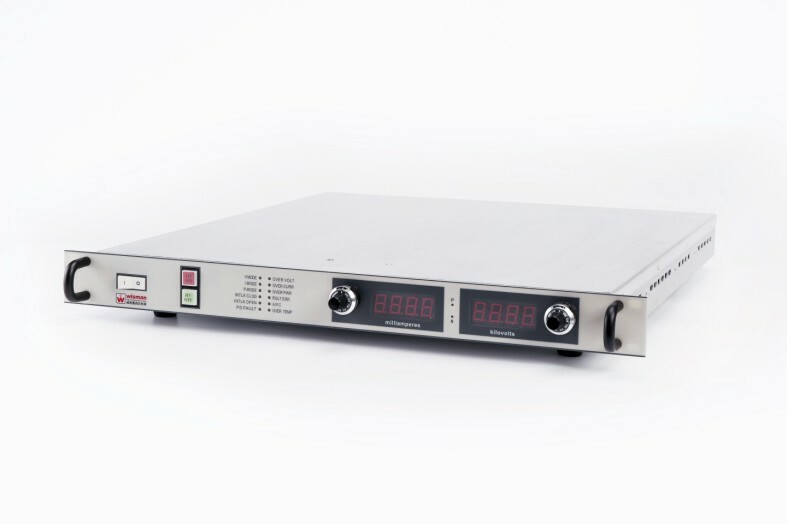 High voltage and filament current can be linearly ramped up .An optional USB 2.0、RS-232 or RS-422 is available .The XRA incorporates local and remote programming,safety interlock.short-circuit and overload protection.TYPICAL APPLICATIONS： Grounded cathode X-ray tubes from Kevex, Oxford, RTW, Superior, Varian and Trufocus....。OPTIONS： CA20N WISMAN CA20N connector. USB USB Interface RS232 RS-232 Interface RS422 RS-422 Interface NAT ARC,does not shutdown AT(X) ARC, shutdown (option 1-8 arc)SPECIFICATIONS：Input: 24Vdc±10% , 3.0A maximum .Output: 6KV、8KV、10KV、15KV、20KV、25KV、30KV 7 models maximum output voltage is available. 1.5W、6W 、10W 、20W、 30W 、40W 6 models maximum output power is available.Voltage Control: Local：Internal multi-turn potentiometer to set voltage from 0 to full output voltage. Remote：0 to +10Vdc proportional from 0 to full output voltage.Emission Control: Local：Internal potentiometer to set beam current between 0 and full output current. Remote：0 to +10Vdc proportional from 0 to full output current.Filament Supply: Current: 0-3.5A, adjustable limit. Voltage: 5.5 volt limit.Voltage Regulation: Load: 0.001% of output voltage no load to full load. Line: ±0.001% for ±10% change in input voltage. Current Regulation: Load: 0.001% of output current from 0 to rated voltage. Line: ±0.001% for ±10% change in input voltage. Ripple: 0.01% p-p of maximum rated output voltage. Environmental: Operational: 0°C to +50°CTemperature Coefficient: ≤25ppm/°C , voltage and current.Stability: ≤0.01%/hour, 0.02% per 8 hours after a 1/2 hour warm up.Voltage and Current Monitors: 0 to +5Vdc proportional from 0 to rated output.Accuracy±1%Dimensions: 2.56”H x 4.53”W x 5.91”D (65.00mm x 115.00mm x150.00mm)Information on wisman and their wide range of high voltage products is available by calling +86-29-3369-3480, or by visiting their website: http://www.wismanhv.comwisman High Voltage power supply is the world's leading provider of custom designed and standard AC-DC and DC-DC high voltage power converters for: medical, industrial, analytical, and security applications; semiconductor manufacturing; scientific instrumentation; and power feed systems for undersea cables. wisman is headquartered in the china. that provide design, manufacturing and service to our customers throughout the world.Wisman high voltage is an ISO9001:2008 registered company. Mass spectrometryPhotomultiplier Tubes(PMT)Microchannel plates(MCP)Proportional CountersGM TubeAvalanche Photo Diode (APD)Solid state detectorsIonization Chambersgas chromatographyElectron multiplierDetectorsNuclear InstrumentsElectrophoresisDNA sequencingRadiation counterElectron BeamIon Beam,Highvoltage biasHipot TestingPrecision Lenses Image IntensifiersSemicon-ductor TestingElectrostatic discharge TestingProvides power to the pulse powerCapacitor DischargingLife SciencesMedical chemical ApplicationsScienceLaboratory ApplicationsIndustrial ApplicationsSUMMARYWisman's PM series of six-sided shielded are high performance products designed with hybrid topology of linear and switch mode power conversion techniques delivering lower noise with higher efficiency.It is applied to Photomultiplier Tubes(PMT),Solid state detectors,Ultrasonic transducers and so on.PM series can control by inside potentiometer and outside potentiometer or computer.An optional RS-232 or RS-485 is available.PM module is available as either a positive or negative supply .that is ideal for OEM applications. SPECIFICATIONSInput Voltage:+24Vdc- +30Vdc@700mA MAXIMUM,Option ±12Vdc ~ ±18Vdc @700mA MAXIMUM.Input Current:Less than 700mA at full output.Output Voltage:0.5KV,1KV,1.5KV,2KV,3KV,4KV,5KV,7.5KV,10KV,Output POWER:2W,2.5W,3W,4W,5W,6W,8W,10W,Output Voltage Control:1) Internal ten-turn potentiometer2) External potentiometer 5k to 100k (set internal pot. to max. )3) Remote voltage programming (0 to +10V gives 0 to full output).Accuracy 0.1%.Remote Control:Remote programming Common Mode Range: 0VDC to +10VDCLine Regulation:0.001% for input change of 5%.Load Regulation:0.001% for 100μA to full load change(at maximum voltage).Temperature Coefficient:Better than 10ppm/°C.Stability:Output Voltage and Current Monitors:Voltage: 0 to +10V represents zero to full output ±1%.Temperature:Operating: 0°C to +50°C.Storage: -35°C to +85°C.Connectors:Input Connector:Accessory: CN8ML:8 pin connector (mating connector supplied).Accessory: CN12ML:12 pin connector (mating connector supplied).Output Connector: A captive 39.4(1 meter) long shielded HV cable is providedDimensions:M1-M9:1.1” Hx3.54” Wx5.12”D(28.00mmx90.00mmx130.00mm)M10-M15:1.16” Hx3.88” Wx6.31”D(29.60mmx98.85mmx160.27mm) Information on wisman and their wide range of high voltage products is available by calling +86-29-3369-3480, or by visiting their website: http://www.wismanhv.comWisman High Voltage power supply is the world's leading provider of custom designed and standard AC-DC and DC-DC high voltage power converters for: medical, ndustrial,analytical, and security applications; semiconductor manufacturing; scientific instrumentation; and power feed systems for undersea cables. wisman is headquartered in the china. that provide design, manufacturing and service to our customers throughout the world.Wisman high voltage is an ISO9001:2008 registered company.